What should I order to get started? Do I need a prescription for the Z1? In general you should consult a medical professional before using a CPAP device, however, there is no requirement to present a prescription to buy a Z1 via the Breas Store. If you already have another CPAP device, we recommend you use the same settings or contact your medical professional or homecare provider. Is my mask compatible with the Z1? Yes, all standard CPAP masks and tubing are compatible with the Z1. The Z1™ is designed to be the most portable machine available. Because of that there is no dedicated humidifier option offered for the Z1. As a great alternative to standard humidifiers HDM offers a disposable heat/moisture exchanger (HME) that has been certified for up to 7 days of use before needing replacement. NOTE: The Z1™ has standard hose sizes and will work with any standard platform type heated humidifier such as the Fisher & Paykel HC150. What voltages will the Z1 operate under? Your Z1™ will run on electricity from 100-240V, which means all international currents as well as the US. It will also run on battery power provided by the optional PowerShell™. Do I need a special plug or converter to use the Z1 overseas? You will need to find the plug adaptor type for the country (s) you are visiting and you may pick one up at an electronics store like Radio Shack, but you will not need a converter since your Z1 has a switch-mode power supply that recognizes the voltage and automatically adjusts to the voltage provided. Will my Z1 work at high altitude if I take it Skiing? Where can I buy the Z1 outside Europe? Important: please note that units purchased in the US cannot be returned for warranty in Europe and vice versa. Warranty cases must be handled through the point of sale of the device. For warranty issues, you have to contact the reseller where you bought the Z1. If the bought the Z1 via the Breas Store, please contact Breas Technical Support at techsupport@breas.com. Your Z1 is warranted for 3 years under normal use and care. With the Z1 is in standby mode, press and hold the Down Arrow Button for approximately three seconds until the 4.0 (or another pressure reading) begins to flash. While the start pressure value is flashing, repeatedly press either of the Up/Down buttons to increase or decrease the start pressure. When the desired ramp start pressure is reached, press and hold the Start/Stop Button for approximately three seconds to save your setting (this setting will be saved even when the Z1 is not powered). The Z1 will return to standby mode. NOTE: To return to standby mode without saving the new setting, press and release the start/Stop button momentarily instead of holding it down. You can also easily change the ramp pressure of your Z1 Auto via the Nitelog app. Does the Z1 have a pressure-relief function? How do I adjust it? Yes. The Z1 uses an advanced algorithm called Z-Breathe™. Z-Breathe™ has 3 settings: ranging from moderate relief to maximum relief for the expiratory phase of your breathing cycle. Z-Breathe™ will also learn your breathing pattern and adjust the baseline accordingly. CPAP / APAP–1 Enables the Z-Breathe™ Algorithm at a gentle response rate which adjusts the airflow gradually during the inhalation-exhalation cycle. In this setting, the algorithm will initially adjust rapidly to breathing, but the adjustments will become gentle and gradual after a few inhalation-exhalation cycles. CPAP/APAP–2 Enables the Z-Breathe™ Algorithm at a medium response rate which adjusts the airflow moderateley during the inhalation-exhalation cycle. CPAP/APAP–3 Enables the Z-Breathe™ Algorithm at the most aggressive response rate which adjusts the airflow rapidly during the inhalation-exhalation cycle. Hold down both the up and down arrow buttons at the same time until you see “CPAP-1” or “CPAP-2” or “CPAP-3” flashing on the display. To lock- in the setting, hold down the Start/Stop button until the “CPAP – X” indicator no longer flashes on the display. You can also use the Nitelog app to easily change the settings of the Z1 Auto. The Z1 goes into standby mode when you plug in to a power source (either the PowerShell/Battery or the Power Adaptor). To start therapy, you push the power button once. To stop therapy, you would push again. To completely turn off the Z1, simply unplug the Z1 from the wall or remove it from the PowerShell. This is a good question however it depends on your personal preference. Some users simply set it on their nightstand since it takes less space than a box of tissue. Others prefer to hang it over their headboard. Your Z1 includes a complimentary Heat Moisture Exchanger (HME) to provide humidification during therapy. HME technology has been in use for over 50 years and is now available for your Z1. The hygienic, disposable HME works by capturing heat and moisture as you exhale and provides it back to you as you breathe. The HME does not use any electricity or complex moving parts and avoids the problems encountered with electrical humidification systems. HME’s are designed for travel and should be replaced after up to 7 nights of consecutive use. To install a Heat Moisture Exchanger for therapeutic use, connect the large diameter end of the HME to your mask and the smaller diameter end to your CPAP Tube. Be sure both connections are fully seated and secure. Your HME is now ready for use. What happens if I am using the Z1 during a power outage? If you are using the Z1 Base + Powershell on AC power during a power outage, the device will automatically switch over to battery power so that you can continue to enjoy a full night of sleep without interruption. When should I change my HME? Heat Moisture Exchangers (HMEs) are tested to last up to 7 consecutive nights. You’ll want to change the HME after 7 nights or when it stops delivering the moisture level you need, whichever occurs first. It is best to purchase a 2 pack of filters each month and change out your filter every two weeks. 1. Minimize CPAP Noise. Placing your CPAP on a foam pad or towel can help lessen the intensity of the vibration. 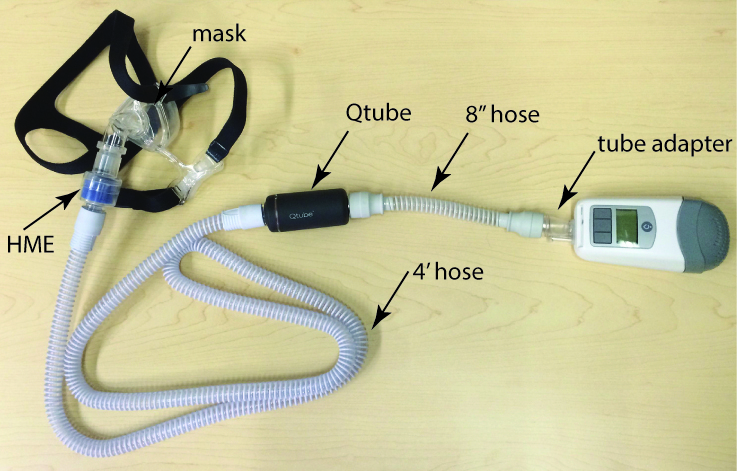 A hose cover like a SnuggleHose may also help muffle CPAP sound. 2. Reduce Airflow Noise. Masks can be a source of sound, especially if you are experiencing leaks. Mask liners may help prevent leaks while lessening facial marks. You may also consider replacing your mask cushion if it no longer holds a proper seal. 3. Location Makes a Difference. Placing your machine lower than ear level may reduce the sound heard. Try using an 8 or 10 foot hose for more range. 4. Purchase a Qtube. The Qtube muffles the windy noise created by the small motor in the Z1. Go to Control Panel –> Programs and Features –> UpgradeFirmware_V….. –> Uninstall After uninstalling old versions of the firmware, try to download the firmware again. The Z1™ battery is designed to be charged and ready for use when you’re on the go. To ensure that your battery maintains a full charge, first allow time for a full charge (up to 8 hours). Be sure that the AC adapter is fully plugged into the Powershell and wall outlet, and that the Z1 is in ‘standby-mode’- meaning when the device is plugged in but NOT in use/ being used for therapy. Once the battery is fully charged, be sure to disconnect it from the Powershell until you are ready to utilize battery power. For travel, we recommend allowing the battery to rest in the Powershell cradle, but not pushing the battery all the way in to connect to the Powershell. If the battery does stay connected in the Powershell, the charge will deplete over time. Please note that it can take up to 8 hours to charge a fully depleted battery. The battery will charge when the AC adapter is plugged into the powershell and wall outlet, but only when the Z1™ is in ‘standby-mode’- meaning when the device is plugged in but NOT in use/ being used for therapy. When your battery has a full charge, it will be displayed on the Z1 LCD screen. If the Z1 appears to stop charging (battery stops blinking during charge cycle) we recommend disconnecting the powershell, battery, and Z1 device completely from each other and then re-connecting all components. If this does not solve the problem, or if the issue presents itself again, please contact your supplier for further support. If you upgraded your Apple phone to iOS 9 and Nitelog no longer works. A new version of the Nitelog app is now available on iTunes Store. This new version is compatible with the latest iOS 9 operating system for iPhone and iPad. Nitelog is a mobile app that allows you to remote-control your Z1 Auto, program settings, and analyze your sleep data from anywhere. It also gives you the control to share your sleep data directly from your iOS mobile device. My Z1 will not turn on. Problems with powering the Z1 are typically related to the power adapter or the battery not being seated properly. If you are attempting to power the device with the power adapter try this. Fully remove the power adapter and inspect both the adapter and the plug hole for obstructions. If no obstructions are found firmly re-insert the plug into the Z1 using a twisting motion. If you are attempting to power the device using the PowerShell’s battery, fully remove the battery module and inspect both the battery module and the contacts inside of the PowerShell™ for obstructions. Yes, but only when the Z1™ is in ‘standby-mode’- meaning when the device is plugged in but NOT in use/ being used for therapy. When your battery has a full charge it will be displayed on the Z1 LCD screen. How long does it take to charge a fully depleted battery? To fully charge a completely depleted battery can take up to 8 hours. What is the lifespan of the 45Wh battery module? The battery has a long lifespan and is rated at 2/3 capacity after 300 complete (not partial) charge cycles. How do I view my sleep data? 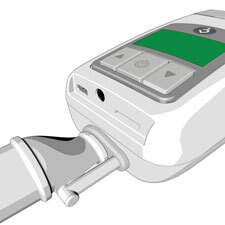 The Z1 CPAP data can be viewed on a Windows based computer via a USB cable. You can download and install the Z1 Data Viewer here: Z1 Data Viewer Download. For the Z1 Auto, you can also view your data on your iOS or Android mobile device with the Nitelog app. The Nitelog app is a free download from the App Store or Google Play Store. Download it directly on your phone or tablet. Do I need a micro-SD card to view my data? No, the Z1 stores data internally on a flash memory. Data can be downloaded with the free Data Viewer software to your PC using the USB cable included with the Z1. The micro-SD port is designed for future capabilities, so we recommend utilizing the device internal flash memory instead. You can also use the Nitelog app to view or share your data from your Z1 Auto to your iOS or Android mobile device (phone or tablet). Does the Nitelog app work with both Z1 Auto and Z1 Fixed Pressure CPAP? The Nitelog app exclusively works with the Z1 Auto and not with the Z1 CPAP (fixed pressure).